If you never tried any Linux operating system, you can try downloading your first Linux distribution with the help of the 'Get Linux' and other resources given in this post. 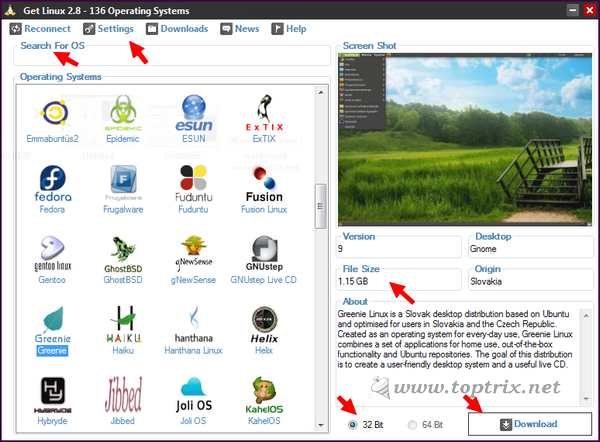 You can preview the desktop screenshot, ISO download size, little information about the Linux distribution, country of origin of the Linux distribution, latest version number available for download and news about the distro. You do not have to search any website or anything else. Get Linux is a small free application that will help you to choose the best Linux distribution as per your requirement and choice. It has more than 136 Linux distribution database to download from. The distro is listed alphabetically and to view the details about any particular distribution, just select the distro. The library of distributions includes the wide range from SliTaz which is just 34MB and Gentoo which is around 3.5GB in size. The information includes the latest version number, download file size of the ISO image, country of origin, type of desktop like KDE, Gnome, Openbox, XFCE and other. The 'about' section gives a small description of the Linux distribution and give you a clear idea about what the distribution is actually. 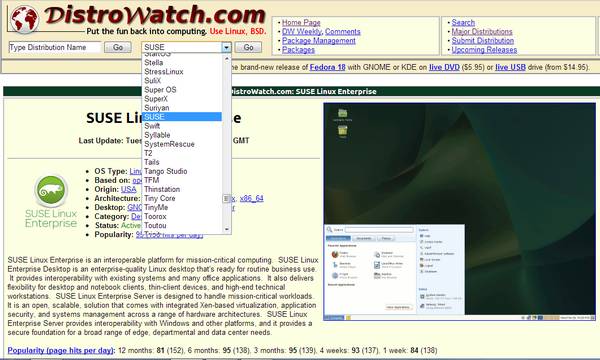 Clicking on the screenshot image will take you to the official website of the Linux distro. You can select from either 32 bit or 64-bit version to download. 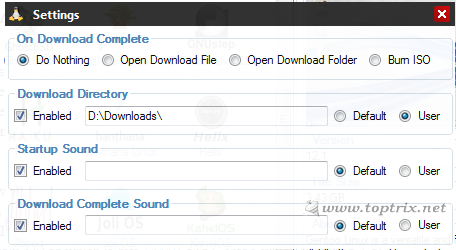 Settings allow you to set download directory, download start sound and completion sound and action to take after completion of the download. You can download Get Linux here. Even though the library of getting Linux is sufficient for most of the others, still then it does not include each and every distribution available over the internet. There are many other flavors of Linux and you may find the library insufficient. For example, Slax is a beautiful and super easy, small Linux distribution everyone should try, but it is not included in the Get Linux library. Also, there is no any way to sort the distribution according to the size of the download file, date of release or something like that. If the same is the case with you, you can try the following online resources. It has a database of more than 310 Linux distributions. Just select the name of the distro from the top dropdown menu and you will get each and everything you need. It is the most comprehensive list of the Linux distributions. Other than download link, it give you information about the origin of the OS, size of the download, architecture, desktop environment, category like desktop and server, popularity meter, little description about the OS, desktop screenshot, homepage website, forum URL, support website, link to more screenshots and many other links for more related resources. You can also download the required packages like GIMP, VLC, Firefox, ATI driver, Chromium and other softwares from the same page. This is another way of finding and downloading your favorite Linux distribution. It has categorized the different flavors of Linux into the Classic, Newbies, Live CD's, Rescue CD's, Floppy Linux, Experts, Power PC, embedded Linux, Linux ISO's and Misc. It includes a large database, their description and download link. The interface is minimal and without any images or screenshots.